Specificity/Sensitivity: This antibody recognizes a protein of 38kDa, identified as synaptophysin. It labels normal neuroendocrine cells of human adrenal medulla, carotid body, skin, pituitary gland, thyroid, lung, pancreas, gastrointestinal mucosa, PanethÕs cells in the gastrointestinal tract and of gastric parietal cells. Neurons in the brain, spinal cord, and retina are also labeled. In combination with anti-chromogranin A and anti-NSE, Ab to synaptophysin is very useful in the identification of normal neuroendocrine cells and neuroendocrine neoplasms.This antibody crossreacts with Human. 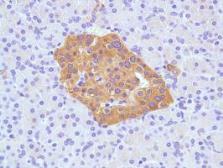 Specificity/Sensitivity: This antibody recognizes a protein of 38kDa, identified as synaptophysin. It labels normal neuroendocrine cells of human adrenal medulla, carotid body, skin, pituitary gland, thyroid, lung, pancreas, gastrointestinal mucosa, Paneth’s cells in the gastrointestinal tract and of gastric parietal cells. Neurons in the brain, spinal cord, and retina are also labeled. 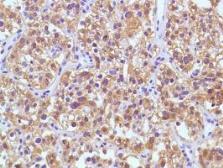 In combination with anti-chromogranin A and anti-NSE, Ab to synaptophysin is very useful in the identification of normal neuroendocrine cells and neuroendocrine neoplasms.This antibody crossreacts with Human. 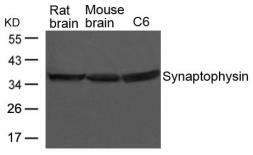 Specificity/Sensitivity: The antibody does not cross-react other synaptic vesicle proteins such as synaptotagmin, GAP45, and SNAP25 protiens.